Lung cancer is cancer that starts in the lungs. The lungs are located in the chest. When you breathe, air goes through your nose, down your windpipe (trachea), and into the lungs, where it flows through tubes called bronchi. Most lung cancer begins in the cells that line these tubes. Non-small cell lung cancer (NSCLC) is the most common type of lung cancer. 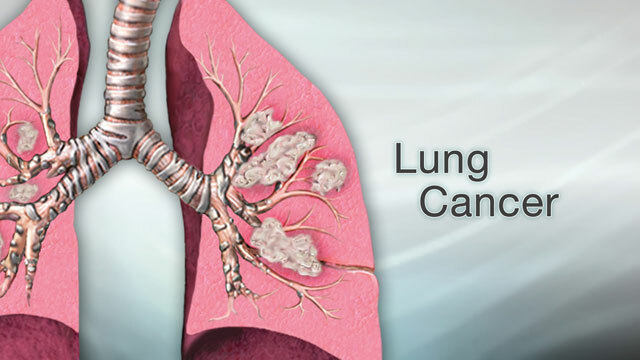 Small cell lung cancer (SCLC) makes up about 20% of all lung cancer cases. If the lung cancer is made up of both types, it is called mixed small cell/large cell cancer. If the cancer started somewhere else in the body and spreads to the lungs, it is called metastatic cancer to the lung. Lung metastases are cancerous tumors that start somewhere else in the body and spread to the lungs. Lung cancer is the deadliest type of cancer for both men and women. Each year, more people die of lung cancer than of breast, colon, and prostate cancers combined. Lung cancer is more common in older adults. It is rare in people under age 45. Cigarette smoking is the leading cause of lung cancer. The more cigarettes you smoke per day and the earlier you started smoking, the greater your risk for lung cancer. There is no evidence that smoking low-tar cigarettes lowers the risk. Lung cancer can also affect people who have never smoked. Secondhand smoke (breathing the smoke of others) increases your risk for lung cancer. Early lung cancer may not cause any symptoms. Wheezing is a high-pitched whistling sound during breathing. It occurs when air moves through narrowed breathing tubes in the lungs. Bone pain or tenderness is aching or other discomfort in one or more bones. Facial paralysis occurs when a person is no longer able to move some or all of the muscles on one side of the face. Nail abnormalities are problems with the color, shape, texture, or thickness of the fingernails or toenails. These symptoms can also be due to other, less serious conditions, so it is important to talk to your health care provider. Lung cancer is often found when an x-ray or CT scan is done for another reason. If lung cancer is suspected, the provider will perform a physical exam and ask about your medical history. You will be asked if you smoke. If so, you'll be asked how much you smoke and for how long you have smoked. You will also be asked about other things that may have put you at risk for lung cancer, such as exposure to certain chemicals. When listening to the chest with a stethoscope, the provider may hear fluid around the lungs. This may suggest cancer. If the biopsy shows cancer, more imaging tests are done to find out the stage of the cancer. Stage means how big the tumor is and how far it has spread. Staging helps guide treatment and follow-up and gives you an idea of what to expect. Surgery to remove the tumor may be done when it has not spread beyond nearby lymph nodes. Chemotherapy uses drugs to kill cancer cells and stop new cells from growing. Radiation therapy uses powerful x-rays or other forms of radiation to kill cancer cells. The above treatments may be done alone or in combination. Your provider can tell you more about the specific treatment you will receive, depending on the specific type of lung cancer and what stage it is. You can ease the stress of illness by joining a cancer support group. Sharing with others who have common experiences and problems can help you not feel alone. How well you do depends mostly on how much the lung cancer has spread. Call your provider if you have symptoms of lung cancer, particularly if you smoke. If you smoke, now is the time to quit. If you are having trouble quitting, talk with your provider. There are many methods to help you quit, from support groups to prescription medicines. Also, try to avoid secondhand smoke. Ettinger DS, Wood DE, Akerley W, et al. Non-small cell lung cancer, version 5.2017, NCCN Clinical Practice Guidelines in Oncology. J Natl Compr Canc Netw. 2017;15(4):504-535. PMID: 28404761 www.ncbi.nlm.nih.gov/pubmed/28404761. National Cancer Institute website. Non-small cell lung cancer treatment (PDQ) - health professional version. www.cancer.gov/types/lung/hp/non-small-cell-lung-treatment-pdq. Updated December 1, 2017. Accessed January 11, 2018. National Cancer Institute website. Small cell lung cancer treatment (PDQ) - health professional version. www.cancer.gov/types/lung/hp/small-cell-lung-treatment-pdq. Updated January 20, 2017. Accessed January 11, 2018. Reviewed By: Richard LoCicero, MD, private practice specializing in Hematology and Medical Oncology, Longsteet Cancer Center, Gainesville, GA. Review provided by VeriMed Healthcare Network. Also reviewed by David Zieve, MD, MHA, Medical Director, Brenda Conaway, Editorial Director, and the A.D.A.M. Editorial team.